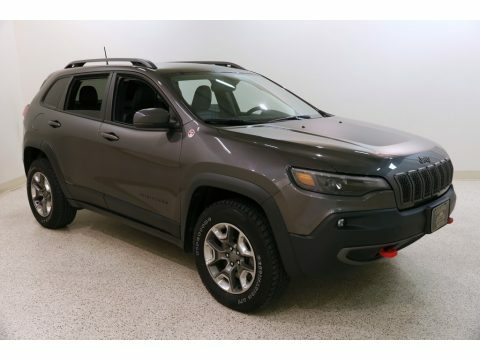 Get out and find your adventure in our 2019 Jeep Cherokee Trailhawk 4x4 on display in Granite Crystal Metallic Clear Coat! fueled by a 3.2 Liter V6 that supplies 271hp while matched with an innovative 9 Speed Automatic transmission. This Four Wheel Drive Trailhawk offers near 28mpg You'll enjoy exploring back roads, mudding, cross country or rock-crawling with ease thanks to the locking rear axle, a 1-inch lift with off-road suspension, and functional skid plates. Our Trailhawk combines classic Jeep elements with a modern and aerodynamic shape accented by off-road aluminum wheels, all-terrain tires, and accent color tow hooks. Inside, you'll see that the cabin's layout is driver-friendly. keyless remote entry, power accessories and a convenient 60/40-split folding and reclining rear seat come in handy. You'll also enjoy staying connected via Bluetooth, touchscreen audio, USB/iPod integration, and available satellite radio. Whether out pounding snowdrifts into submission or coasting down the freeway, our Jeep Trailhawk has all the creature comforts you'll need to keep that smile on your face.Anti-lock disc brakes, stability and traction control, and multiple airbags are in place to keep you safe and secure. This winning combination of capability, comfort and style are sure to please you! Print this page and call us Now... We Know You Will Enjoy Your Test Drive Towards Ownership!